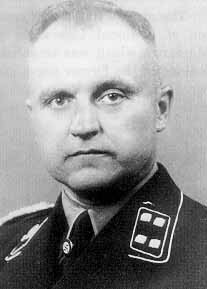 Image: Karl Otto Koch, first Commandant at Majdanek Concentration Camp, Poland. Karl Otto Koch and Erich Koch are the ghosts of Koch Industries, who seized the U.S. conservative political agenda years ago and seem capable of seizing the government in total through the Tea Party. Ilse Koch was the Nazi’s specialist in making objects from human skin; was the only woman charged with war crimes; and along with her husband was in charge of one of the most horrific horror camps in Nazi Germany. The Kochs must be stopped. Or is it too late? They already own us all don't they? But that can be reversed, sadly it would probably require a bloody revolution. These kinds of people cause so much grief that is so unnecessary. The saddest thing of all is that their are slaves to their own wickedness, and don't care, and don't care if our entire nation suffers for it.